Are you feeling overwhelmed by the places to see in Vietnam? Have you noticed it’s difficult to organize an itinerary when you want to see both the North and the South with only a little time in this great country? I have you covered with a breakdown by region with the best cities to visit. If you’re short on time but still want to make the most of your trip to Vietnam, you’ve come to the right place. In this article, you’ll get a quick rundown of what there’s to see in each area and how much time you should plan for each place. We hope this will make it easier for you to create an itinerary which focuses on the side of Vietnam you are most interested in exploring, be it nature, history, culture, food, or a bit of everything. Known for its countless beautiful islands, clear blue waters and breathtaking landscapes of jagged karsts rising out of the sea, it’s no surprise that Ha Long Bay is one of the top must-visit spots in Vietnam. It’s unlike anything else you will see in the world which is why it’s the perfect way to start or end your trip to Vietnam. There are plenty of ways to explore the bay, whether you want a relaxing cruise, a fun adventure or are on a tight budget, there is an option for everyone. 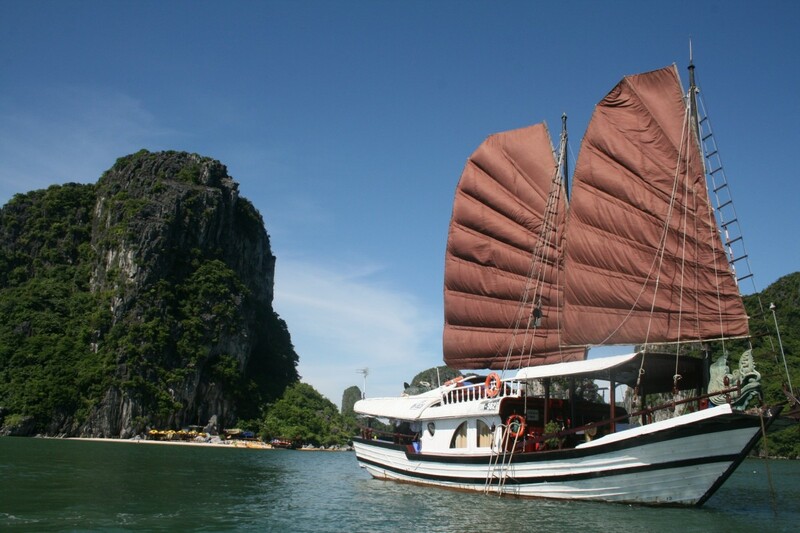 One thing goes for all trips to Ha Long Bay though: take your time! You will find one-day cruises at many tour operators’ offices but those don’t take you to some of the cool hidden spots (like deserted beaches or eerie caves) and barely scratch the surface of the bay’s beauty. We recommend a minimum of two full days to explore Ha Long Bay, with one night spent on the boat, under the twinkling stars. When you get there, you’ll understand why. If you have more time, add an extra day to check out the neighboring Lan Ha Bay. It’s also breathtaking and less busy than its more popular neighbor. Nature-lovers listen up! 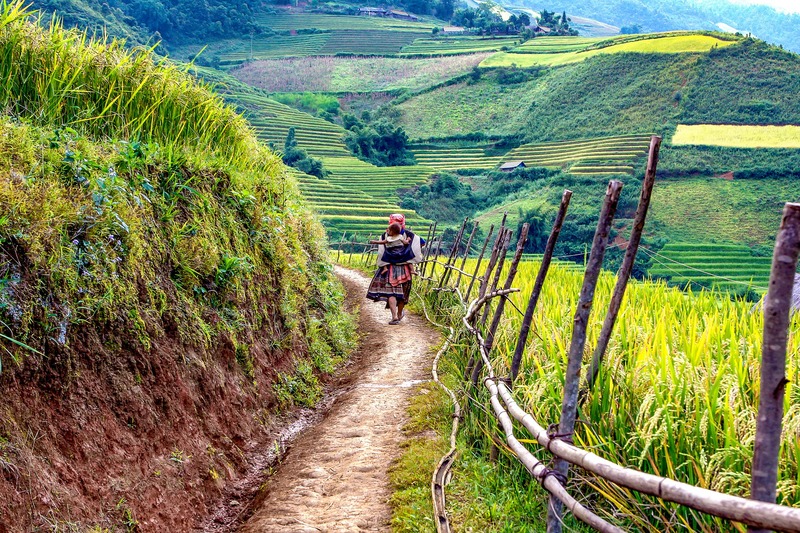 If you’re already in northern Vietnam and you want to get your fill of endless rice paddies and lush green forests, Sapa is the place for you. Also home to the country’s highest peak, Mt. Fansipan, it offers a challenge to experienced mountaineers and hiking newbies. It rewards you with awe-inspiring views of the surrounding mountains, villages, forests, and fields. To make the most of your time in Sapa, spend at least two full days there. Once you get to the town, you will need to find a guide and negotiate a package with them i.e. how many days you want to spend with them, where you want to go and whether, or not you’ll be staying overnight at their house. For more ideas on how to plan your trek, where to go and what to watch out for, check this guide to trekking in Sapa. We suggest you go for at least a two-day tour including one night at a local homestay. You have the chance to get away from the busy trails, venture further from the town and get to know your host and the culture of the hill tribe she belongs to. Even for only one day, Sapa is amazing. But keep in mind you will likely stay on the busy one-day paths and miss out on getting to know your guide and their family which is part of what makes a trip to Sapa so special. If you have extra time or are serious about trekking, plan two to three days to conquer Mt. Fansipan. We’ve put together a complete guide about climbing Vietnam’s highest mountain to make planning easier for you. After all that hiking, you might want to add half a day in Sapa town to explore markets, shop local handicrafts and take a rest. That way you’ll be fresh and ready to go for your next adventure! Hanoi, Vietnam’s capital, is a great place to start if it’s your first time here. Rich in history, beautiful architecture and amazing food, Hanoi will show you the essence of city life in Vietnam all while teaching you about the country’s turbulent past and exciting present. If you only have one day in the city, make it count! You can start by exploring the Old Quarter and its countless tiny alleyways crammed with shops and food stalls. After wandering around and trying way too many yummy treats, it’s time for some history. 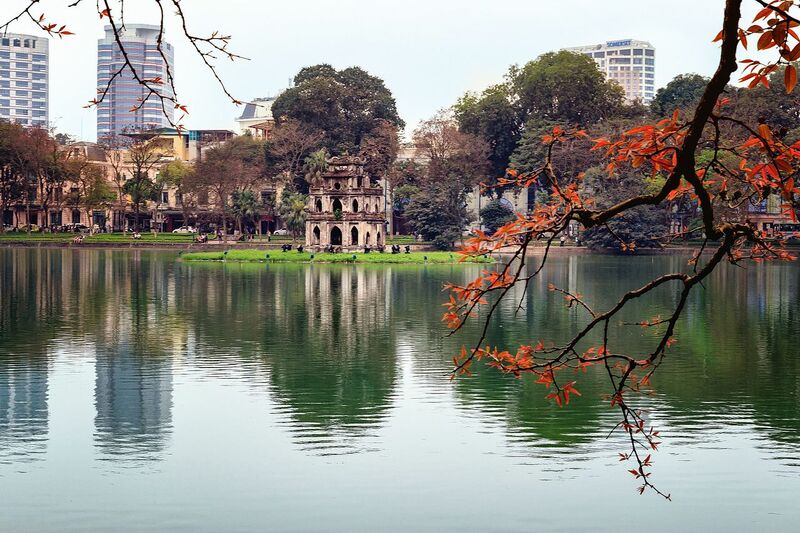 Visit the Ho Chi Minh Mausoleum and Museum to learn about the country’s national hero and then head off to the serene Hoan Kiem Lake or the Temple of Literature to get a break from all the noise and traffic. In the evening, trying one of the local beer bars and having a bia hoi (local draft beer) is an absolute must. Now all that sounded like a bit much, didn’t it? That’s why we suggest you spend two days in Hanoi to give yourself some more time to take in the city and add some cultural experiences like a water puppet show or an afternoon of coffee shop hopping. That way you’ll also have the opportunity to try more of Hanoi’s amazing food. Got an extra day to spend in Hanoi? Great! You can use it for a day-trip to one of the many handicraft villages around the city to see how local experts make crafts unique to Vietnam. Whether you’re looking for a souvenir or want to know how silk is woven, how traditional Vietnamese embroidery is still done by hand or how musical instruments are made, you’ll find all of this in and around Hanoi. And with all that extra time on your hands, why not add a stop at one of the city’s happening nightclubs, bars or jazz lounges? 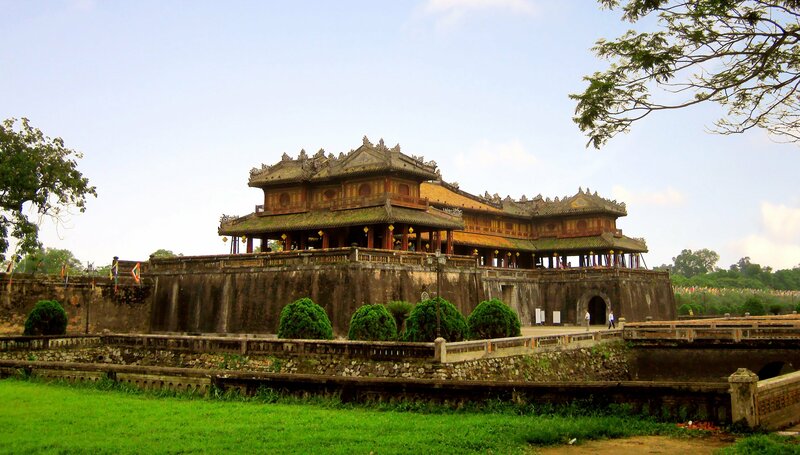 Hue is probably the city richest in Vietnamese history with its many temples and of course the citadel. If you love learning about a country’s past and want to get a feel of what life was like in the shoes of Vietnamese royalty, Hue needs a spot on your itinerary. 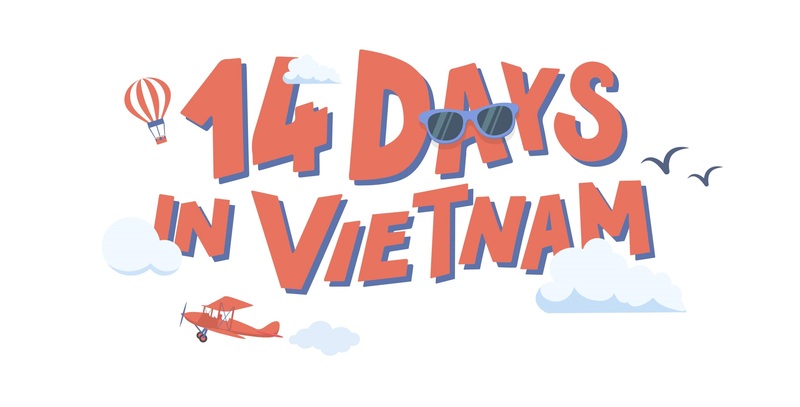 In one day, you can see most of the city’s amazing sights and spend some time wandering Hue’s streets in search of the perfect bowl of bun bo Hue, the local noodle soup which will most certainly have you coming back for more. Check out our guide to the perfect day in Hue for a full itinerary! Having been the home to the ruling family for centuries, Hue is known for its excellent chefs who masterfully prepare royal Vietnamese cuisine. Get ready for amazing food and beautiful presentation! Still looking for something to do in the afternoon? Rent a bike or hire a driver to take you to the royal tombs scattered along the shores of the Perfume River. They are a sight to see as each grave reflects the king’s individual style. For travelers with more time, Hue is a perfect place to spend a few extra days. Explore the many pagodas in and around the city, head out to Bach Ma National Park or go for another off-the-beaten-path adventure like learning more about traditional lettering and literature or checking out an abandoned theme park. After getting your fill of local history, it’s time to get back out into nature and see more of Vietnam’s natural wonders. As you travel from Hue to Danang, you can opt for one of the country’s most scenic routes: the Hai Van Pass. Its steep, winding roads take you to exceptional viewpoints and offer sweeping vistas of Vietnam’s coastline, surrounding hills and nearby beaches. Just outside the city, Son Tra Peninsula is worth a stop as well. While you could walk to the top, it’s faster to go by motorbike and will save you some energy for the rest of the day. At top of the hill, you will find a wonderful temple with a breathtaking view of the city and one of the biggest statues of the Lady of Mercy in the country. 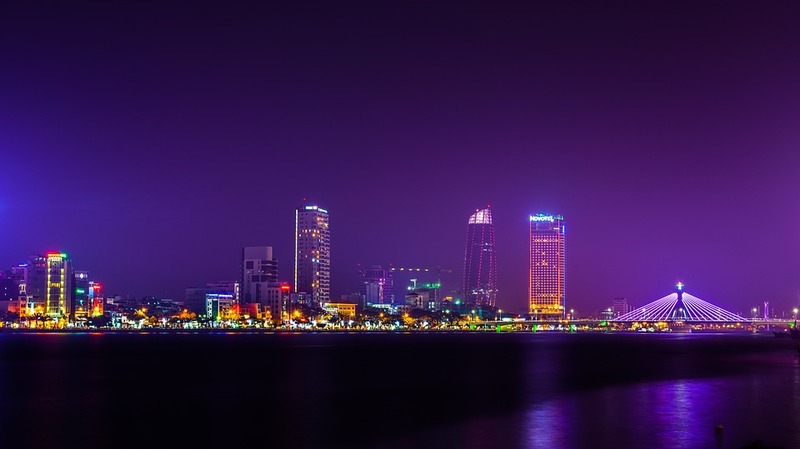 Once you get to Danang you have even more to see! Spend a few hours at the Marble Mountains and discover ancient caves dug into the mountains by Buddhist monks, later used during the Vietnam War as a hideout for soldiers and civilians. After all this, you’ve earned a break and some time to chill out on a beach. 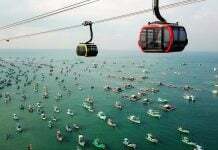 Good thing Danang has so many to offer! And that brings us to a well-meaning suggestion: spend more than one day in Danang if you can. There are so many more amazing and interesting things to see and do around the city, you’d really be missing out if you skipped it. For example, you can take a day trip to My Son, ancient Khmer ruins bearing witness to a people who lived and flourished here many centuries ago. Or you could explore the European-style village and theme park perched on top of Ba Na Hill. There are also some springs and waterfalls to check out just a short drive from Danang, so if you want to spend some more time in nature, Danang has got you covered for at least two or three extra days. Just a stone’s throw from Danang, Hoi An can be done as a day trip from Danang. In one day you will easily be able to walk around the old town with its traditional houses, pagodas and countless shops selling local food, handicrafts and clothes. 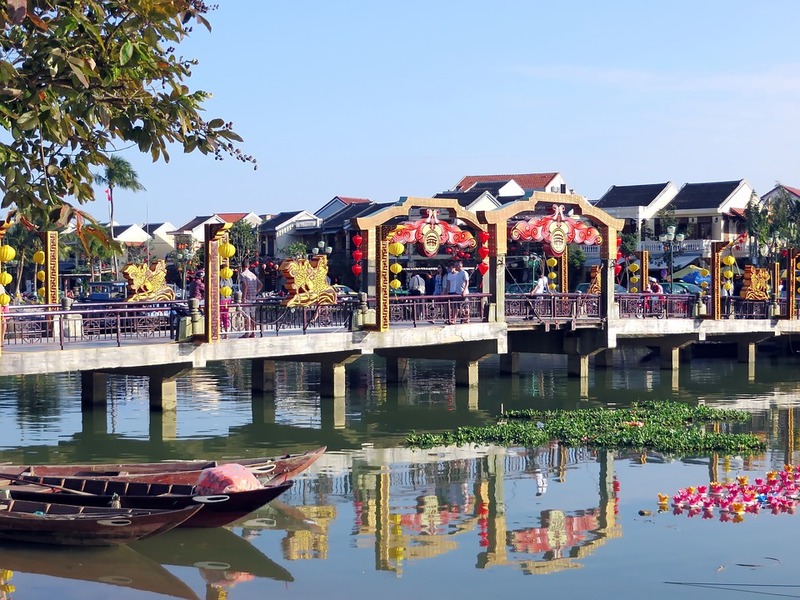 Named a UNESCO World Heritage City, Hoi An is famous for its Japanese Bridge, the long rows of historic, yellow houses and colorful Vietnamese lanterns which light up the city at night. Come here for an idea of what many cities and towns in Vietnam were like decades ago and take a journey back in time as you visit some of the ancient houses now converted into museums. You’ll even get a peek into the life of rich merchants or aristocrats whose homes are still preserved and make for a great history lesson. Got some extra time? Good, because there are many more things you can do in and around Hoi An. Foodies will be delighted to hear that close to the city is an entire village specializing in farming organic vegetables, herbs and fruits. 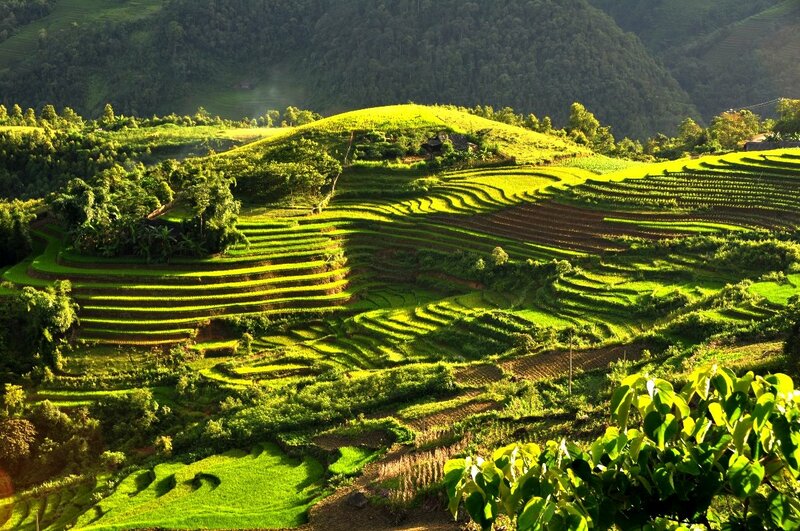 Get a tour there and see how produce is grown, learn to prepare it, indulge in your freshly cooked meal and get a feel of rural Vietnam while you’re at it. 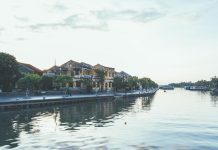 If you’re more interested in kicking back and relaxing, Hoi An has some wonderful beaches which are generally less busy than those in Danang. 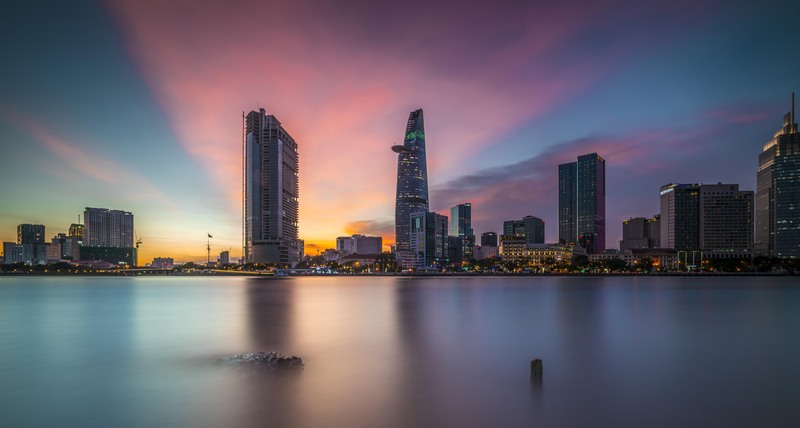 The commercial capital of Vietnam, Ho Chi Minh City is quite different from Hanoi. Even so many years after the French have left, the city still exudes a very distinctive charm and style, a result of decades of French rule and influence. You will also find plenty of things bearing witness to the Vietnam War and how it impacted this part of the country. To see the main sights of Ho Chi Minh City, plan at least one full day of intense sightseeing. That way you can cover the Independence Palace, the War Remnants Museum, and historic downtown area. You’ll also want to add plenty of stops for local food such as the southern version of pho, a banh mi or various other street food delights. Add an extra day in Ho Chi Minh City to visit Cho Lon (Chinatown) and explore the wonderful temples there as well as the yummy food. A second day will also give you more time to test coffee shops, eat more of the city’s famous street food, check out some markets and other spots most tourists miss. For beer lovers, Ho Chi Minh City also has a few treats in store so be sure check out our guide to the drinking culture in Saigon. Got even more time to spend? Then book a day trip to visit the famous Cu Chi tunnels where resistance fighters hid out during the Vietnamese War, head over to Ban Den Mountain for some more trekking or check out this article for more inspiration on what to do around Ho Chi Minh City. Head southwest from Ho Chi Minh City to leave the hustle and bustle behind and get a taste of country life in Vietnam. The Mekong Delta is a fantastic place to slow down and take time to explore another side of Vietnam. 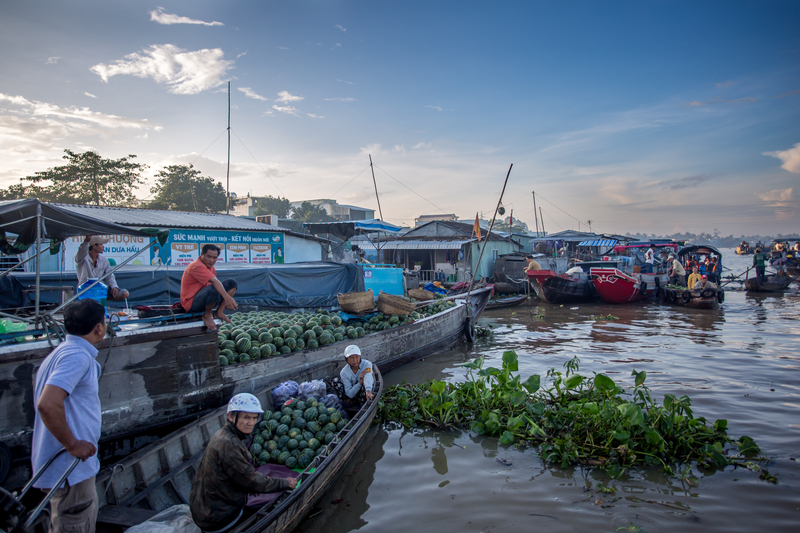 There are several towns you can visit in the Mekong Delta including the charming Can Tho and the busy My Tho, each with its own collection of interesting markets, pagodas, and other sights. Nestled in the lush green landscape, the towns around the Mekong Delta are ideal to spend a tranquil day at a homestay. Let the hosts take you around to local markets, show their favorite spots and maybe even join them in preparing your dinner to learn how to make tasty Vietnamese specialties. We recommend you stay overnight as it will give you the chance to spend time with your host and learn more about their way of life. Since it’s quite different from the big cities, this is a fun and valuable experience if you want to get to know the many facets of Vietnam. To make the most of your time in the Mekong Delta, a two or even three-day trip would be best. That way you can explore the different towns. Spending one day will give you a sneak-peak but two or three will provide a much deeper, more memorable experience. Traveling around Vietnam is quite different from Europe or North America. While distances aren’t that great, be aware that you will be sharing cross-country roads with buses, trucks, and a slew of other more or less motorized vehicles like motorbikes, scooters, and ox-carts. That can quickly turn a 200 kilometer drive into a four or five-hour journey. Traveling by bus is very common in Vietnam. To avoid losing a day of your trip, take a night bus for a long journey. Sleeper buses are available and are a great option if you have trouble sleeping in regular buses. While they are obviously not as comfortable as a real bed, they do provide a bit more space to lay down and get some rest. Remember though, these vehicles are built with Vietnamese passengers in mind. If you are very tall for example, you might find the sleepers quite tiny and cramped. A night bus will be slightly more expensive than a regular one but the chance to get sleep and be rested for your next day is worth it. Check out vexere.com for more information and booking options of buses all around Vietnam. To get a head start on the day, you can grab super early flights provided by budget airlines like AirAsia or VietJet. 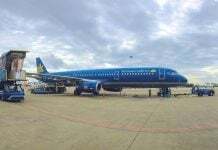 While catching a flight around six or seven in the morning might seem like an ungodly thing to do on vacation, it’s a great way to save time and make the most of every single day you spend in Vietnam. Is that too much to remember? No worries! We’ve made this all-in-one infographic that summarizes the journey, just for you. Make sure to download it and tick the must-do’s as you go along! Now you know all the must-visit spots in Vietnam! Which ones are your favorites? Remember, there is so much to do and see everywhere in Vietnam that it’s impossible to get bored wherever you are. Another amazing pagoda, delicious street food stall or beautiful landscape is never far away… all you need is the time to explore and take in the kaleidoscope of experiences, sights, sounds, and flavors that is Vietnam.